Believe me, I understand completely with regards to feeling like you are so behind on everything that it was as though Christmas was not celebrated as you hoped it would be. This year it hardly felt like Christmas at the Dutchman House. But maybe that has something to do with the weather here in the Southwest because the high today was 75 degrees, and that’s just awfully hot for January. I feel like I even sluggishly approached the New Year, which is thoroughly unlike me. I usually have 20 goals planned and even a yearly theme picked out, but this year I barely have an inkling of what I would like to accomplish and I am waiting for the “opportune time” to begin my resolutions. Heaven help me. 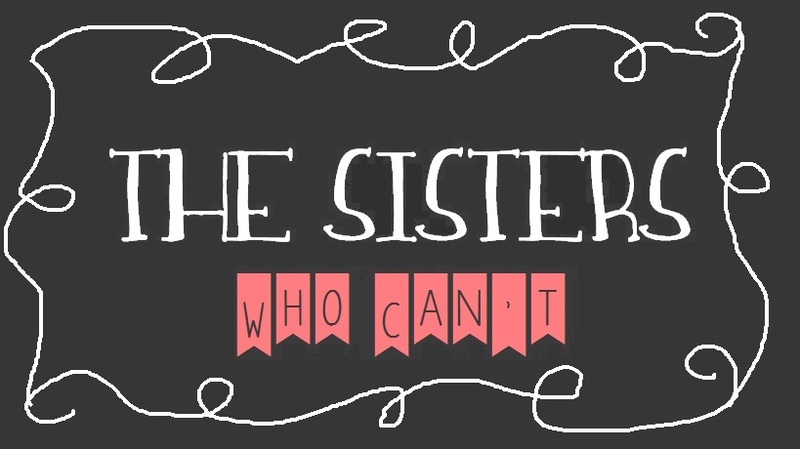 But I do know that at very least the one thing I do want to tackle this year is STUFF. Abe and I have so much stuff. We live in a house meant for five or six and shop like we’re a family of twelve. We’re both descendants of rainy day types of folks and we save all sorts of things just in case. Of course there is nothing wrong with preparedness, and we have food storage that has saved us countless times when we have found ourselves in a pinch, but things are out of hand. For example, Abe owns entire wardrobes in various sizes. Whereas I pretend like I don’t have a ton of stuff but I really just sort through things then put them in a box in the garage. Then I think to myself, “Hey, where were those one shoes?” and then I rescue them (and more) from the box in the garage. Obviously, it is a very productive process. This weekend Abe and I found ourselves in one of those aforementioned pinches and decided it would be the perfect time for a garage sale to help us bounce back a little. It was quite the white trash affair. We only have one folding table which we piled high with unwanted kitchen items. Abe constructed “tables” out of cardboard boxes which he covered with old sheets or curtains where we piled as many knickknacks as possible. Then I ransacked our closets for every available hanger (which wasn’t close to enough). I began pulling clothes off their existing hangers and throwing them every which way so I could hang up all the clothes we were selling. Abe had me make the signs and because we didn’t have any poster board, I wrapped extra cardboard boxes with brown paper; and because we didn’t have any sharpies I used acrylic paints to paint our signs by hand. Abe gave me specific directions to make all the arrows on the boxes going the same way. In my brain that didn’t seem to make much sense so I sought clarification as to which direction he wanted the arrows. “Doesn’t matter which way,” he said. Still confused but ever-trusting, I figured Abe knew what he was doing when it came to directions and decided to make all the arrows point left. Sadly, this was not what Abe had meant. He did not mean that all the arrows should be drawn in all the same direction, but that each arrow on either side of the box should be facing the same direction so that the box could be turned whichever way to point garage sale goers to the proper house. Abe didn’t realize my mistake until the morning of our grand garage sale, so I quickly had change the direction of some of the arrows leading to slightly confusing looking signs. Abe learned that he needs to be more specific with one as directionally-challenged as yours truly. 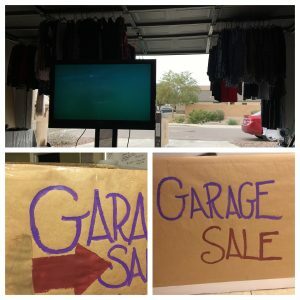 We spent our Saturday camped out in our garage watching Netflix from the old TV we were wanting to sell and stealthily attempting to “outsell” one another. In the end we really did not make much money, but thankfully enough to help us in our pinch. Once the sale was over, I wanted to box everything we did not sell (quite a lot) and ship it off to Goodwill so that it could be out of our lives forever. Abe, however, believed the garage sale was great fun and that we should keep the garage in its garage sale state and keep having garage sales until we could garage sale no more. I simply want to get rid of stuff, but Abe sees it all as a giant pile of cash to be made if we can only lure in the right buyers. I am afraid this sorting thing just isn’t sorting out.